“Starting next week, Metro customers will be able to bring their bikes with them on the train – at any time – as Metro ends a longstanding restriction that prohibited bicycles during rush hours. Metro reviewed its policy and determined that it could respond to requests from the bicycling community by ending the rush-hour bike restriction without significant negative effects. The review took into account that the majority of rush-hour trains are 8 cars in length (the longest possible), and that new 7000-series trains provide more open space. When Metrorail first opened, bikes were not allowed in the system at all. Since then, Metro has incrementally loosened restrictions without significant problems. Bikes were first allowed in 1982, with a paid permit on weekends and holidays only. The days and hours when bikes were allowed gradually expanded over time. Permits were eliminated in 1998, and the current policy was established in 2001, allowing bikes at all hours except weekdays from 7-10 a.m. and 4-7 p.m. Starting Monday, standard-size bikes will be allowed at all times, on any car of any train, provided that space is available. Customers with bikes are reminded to use the doors at either end of the railcar – not the center doors – and to avoid blocking doors or aisles. Metro will monitor implementation of the new policy to determine whether any modifications are necessary. 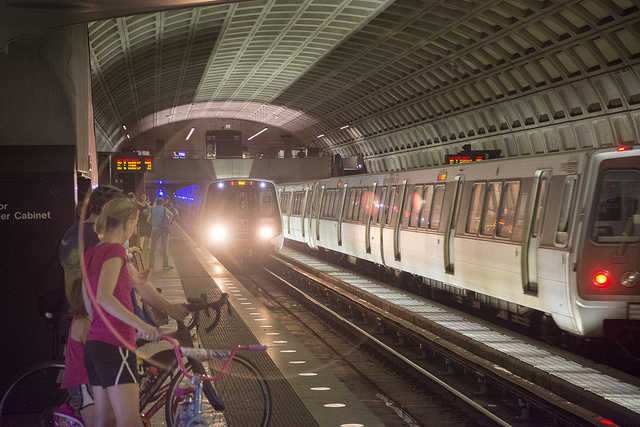 In addition, Metro reserves the ability to restrict bicycles on the rail system during major events drawing high ridership, such as July 4 fireworks and Inauguration Day. Customers can also bring their bikes with them on Metrobus. All 1,500 Metrobuses are equipped with a rack on the front that can accommodate up to two full-size bikes at a time.